Are you looking for a periodontist who can meet all your serious periodontal needs? At the Acton office of Dr. Stephen H. Grossman, you’ll find the comprehensive care you need to reclaim your health and wellbeing. Dr. Grossman has over 30 years of in-practice experience, in addition to years of advanced education training. He is also a clinical instructor at the distinguished Harvard School of Dental Medicine, and he is the periodontist on staff with Emerson Hospital. 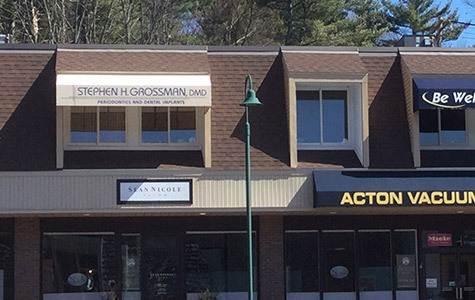 Our office, located in Acton, allows Dr. Grossman to provide exceptional periodontal and implant care to patients from Northeast Massachusetts. In addition to offering comprehensive solutions for missing teeth and periodontal disease, we’re also equipped with some of the most advanced technology available today, including LANAP soft tissue lasers. These tools have enabled us to provide care that’s more comfortable and efficient than ever before. In addition to serving patients who come to his directly, Dr. Grossman also sees many patients who have been referred by another doctor. That speaks to both his reputation within the industry as well as his expertise. If you’re a doctor and need to refer one of your patients to a periodontal or implant specialist, we are happy to be of service. “I have had considerable periodontal work done by Dr. Grossman over many years. Not only have I had excellent treatment results, but I have also found his interaction with me as a patient to be outstanding. He listens carefully and respectfully to my concerns and he communicates clearly the details and expectations of all procedures in a constructive way that allows me to make informed decisions. Needless to add, his overall practice is impeccable.” Matt T.
I have been a patient in this office for many years. The professional staff is top notch and Dr. Grossman combines clinical excellence with wonderful chair side manner. I have received multiple gum grafts from him and have never had significant pain. - Honi K.
I've been a patient of Dr Grossman for over 10 years, and during that time I've received what I consider to be outstanding care. A visit to his office is like visiting family. Everyone knows me and I've come to know a number of the people on his staff. I'd readily recommend Dr Grossman to anyone in need of a periodontist. – John K.
I had work done by Stephen Grossman a few years ago and I could not have been happier. From the moment I made my first call to the office and scheduled my appointment until when the work was complete, I enjoyed friendly, courteous and capable service. I recommend Stephen Grossman highly if you are looking for great periodontal work. – Richard T.